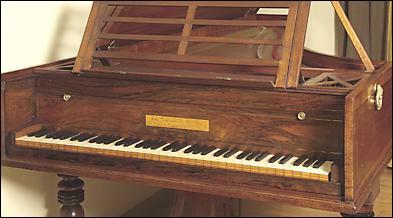 A rare example of the most iconic Broadwood Grand Piano, being almost identical to the instrument presented to Beethoven by Thomas Broadwood after his visit to the composer in Vienna. An entry in the Broadwood Archive shows that the example offered here left the Broadwood factory on 22nd December 1815. Prior to its recent restoration, it formed part of the Cobbe Collection and was exhibited at the Fitzwilliam Museum in Cambridge. The six octave keyboard CC-c4 has ivory naturals and ebony sharps. 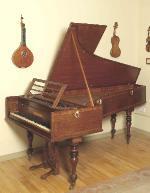 The case is crossbanded mahogany with ebony stringing, the keywell being veneered in rosewood with brass stringing.